There may come a time when your business would start a project and there would be a need for a strategic alliance with an individual or a team in order to complete it. 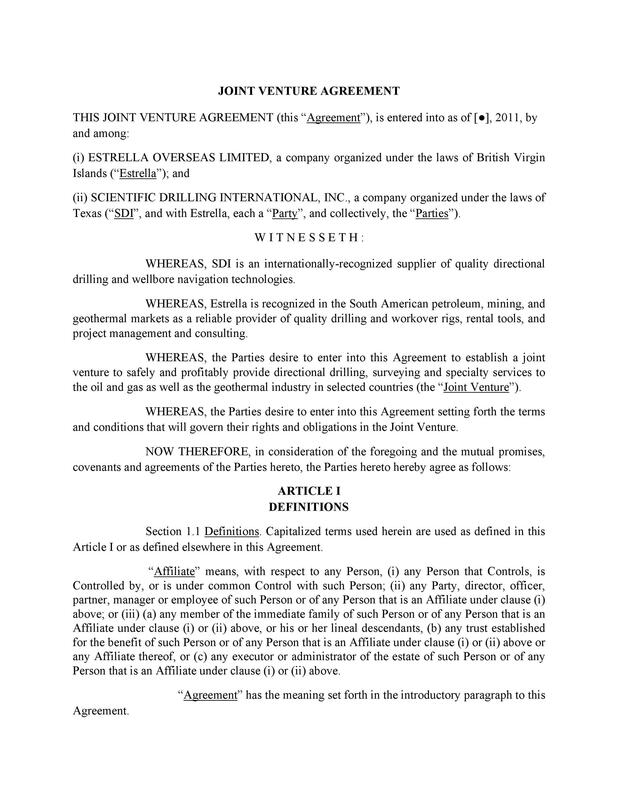 In cases like these, you would most likely need to make a joint venture agreement so that everything would be clear to both parties involved. Unlike a partnership which would last longer or even permanently, a joint venture would only last as long as the project is ongoing. As soon as the project is completed, then the joint venture would come to an end as well. 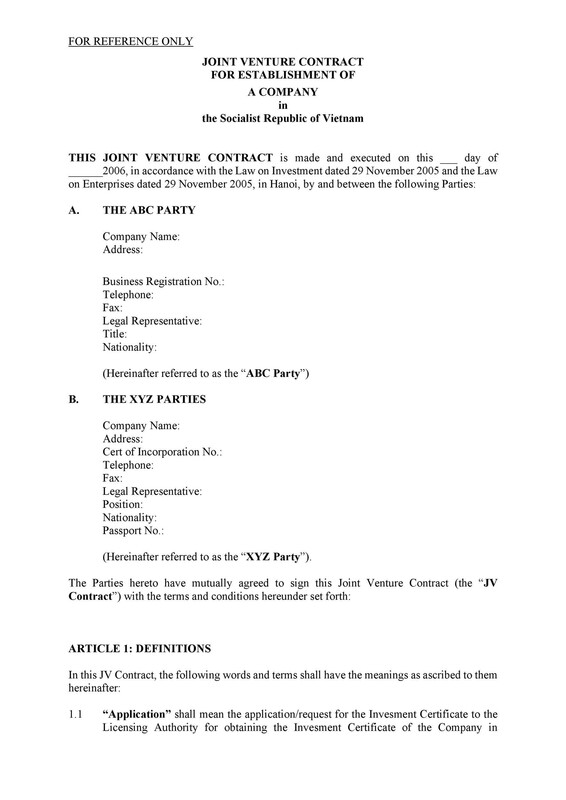 Having joint ventures would generate a separate legal unit, apart from the business units of each individual party. This means that costs, income, and ownership of assets would run through the joint venture and go straight to the individuals or businesses involved. Both parties would have to make contributions of their assets, maintain equality and agree on how the unit is to be managed. Once the business project or activity has been completed, it would mean that the joint venture has met its objectives and the unit would also come to an end. 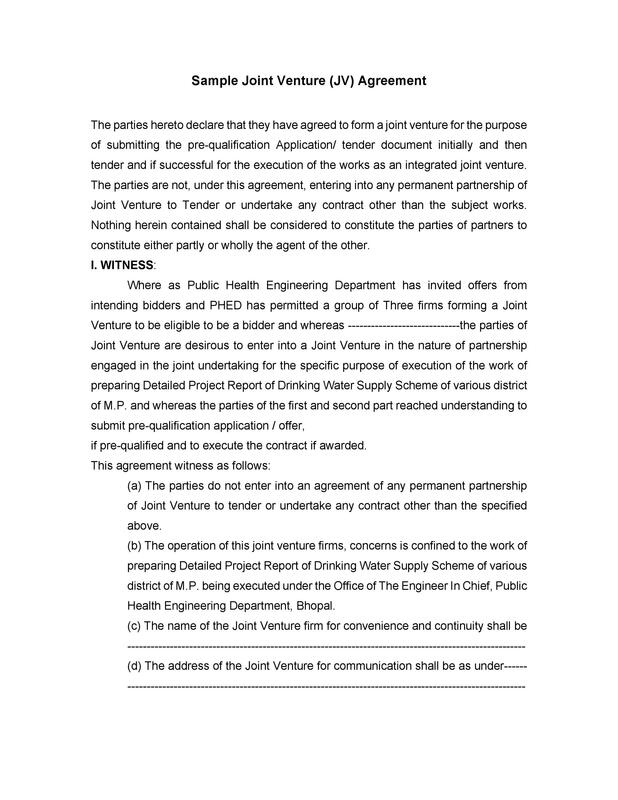 Typically, two parties enter into a joint venture would do so for their own individual benefits, which would usually come from the main objectives of the business project they plan to undertake. 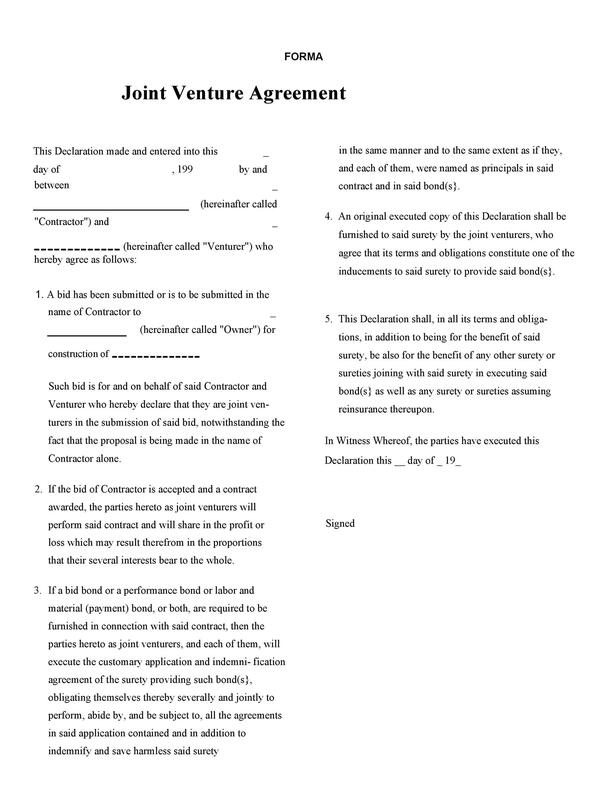 Whatever purpose you may have for entering a joint venture agreement, the most important document which you should have is a joint venture agreement. 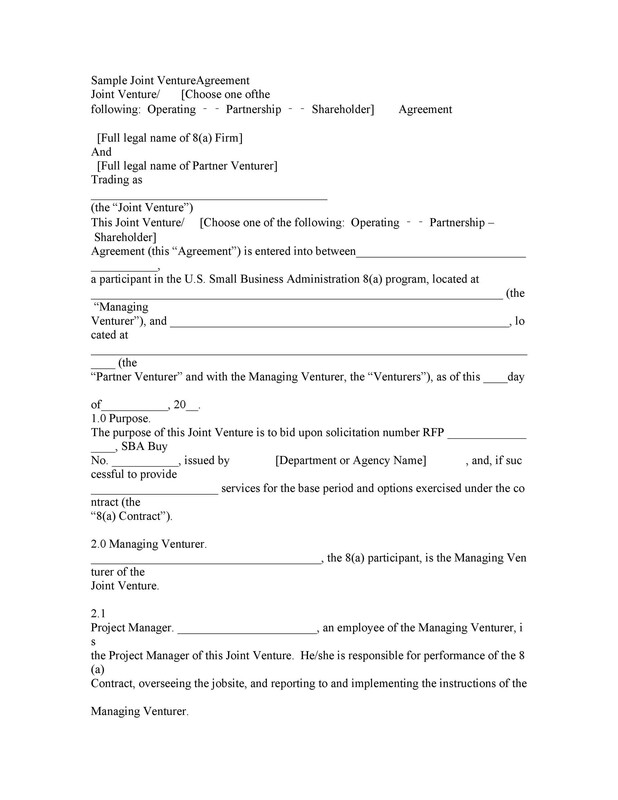 If you are planning to enter into a joint venture, you should know how to make your own joint venture agreement template. 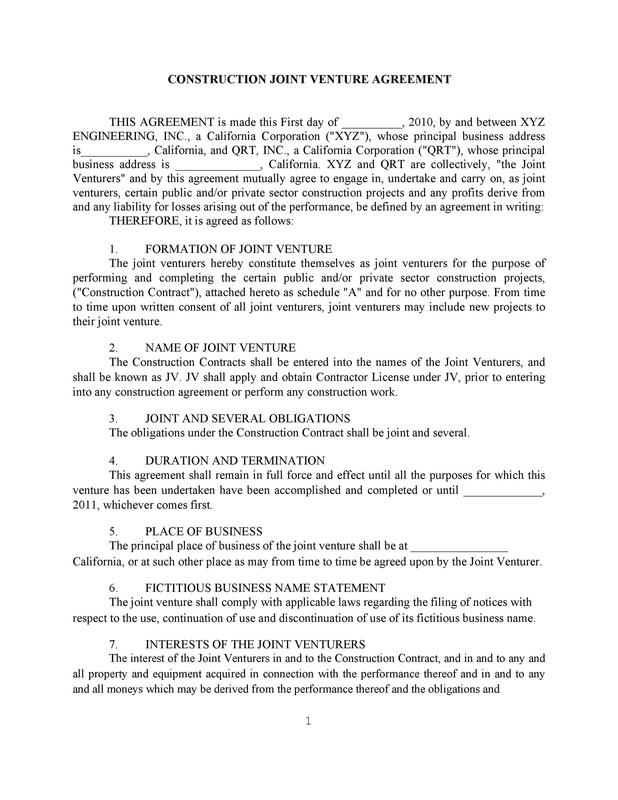 In this article, you will learn all about joint ventures, joint venture agreements and even steps and tips in making your own joint venture agreement sample. Read on to learn all these relevant information to be guided for the future. 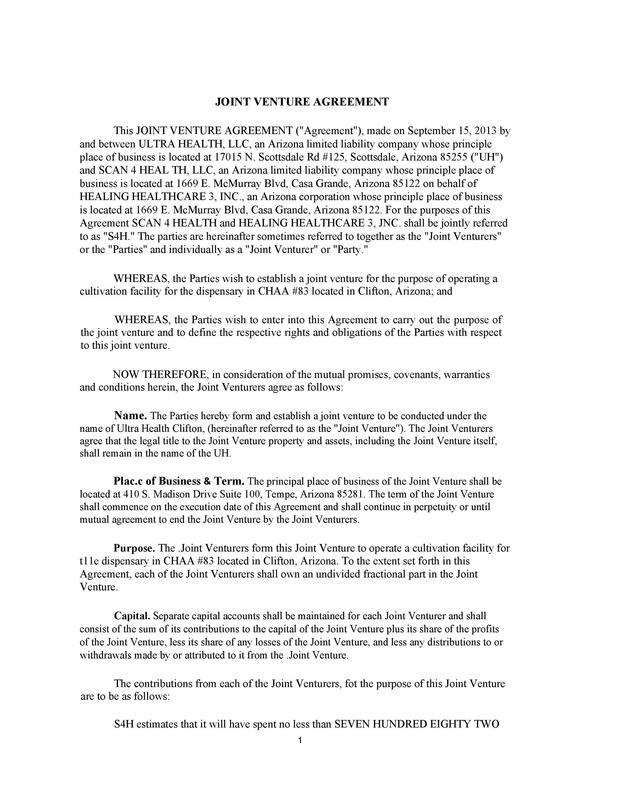 Since the joint venture agreement is an essential document to have when entering a joint venture, then it probably comes with a lot of benefits, right? 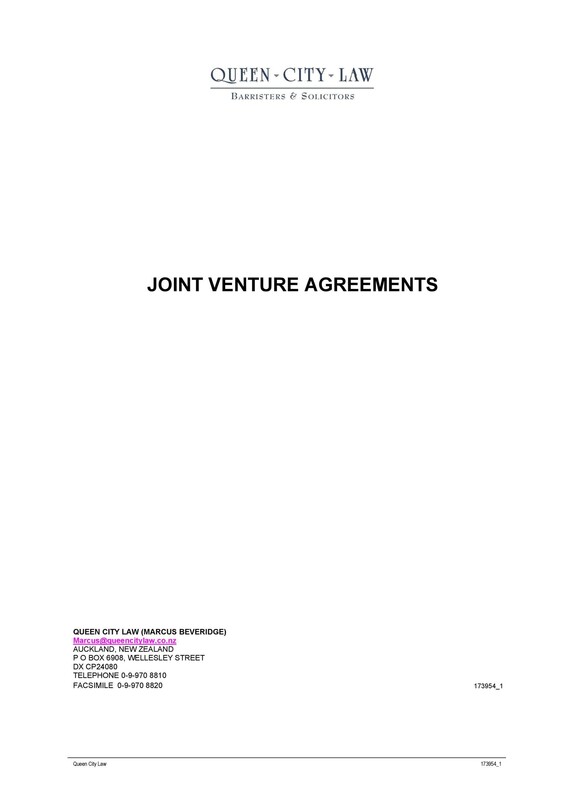 The answer is yes, there are a lot of benefits to making an actual joint venture agreement template which we will be discussing now. Learning these benefits would help you make an informed decision on whether you’d want to make one for your next joint venture. It would give you a chance to learn new things, gain insight and expertise in your field of business. Entering into a short-term joint venture with another individual or organization would expose you to other perspectives which in turn would allow you to understand how things work a lot easier. Entering a joint venture would allow you access to more and possibly better resources as you would be sharing everything related to your project or business activity. These resources could be in the form of special equipment, expert staff members as well as any new technology which your own organization may not yet have. Both parties would share everything equally – from risks and costs to benefits and proceeds. This would mean that if in case your project fails, you won’t have to deal with the failure on your own. Both parties would be liable and both parties would end up supporting the losses. 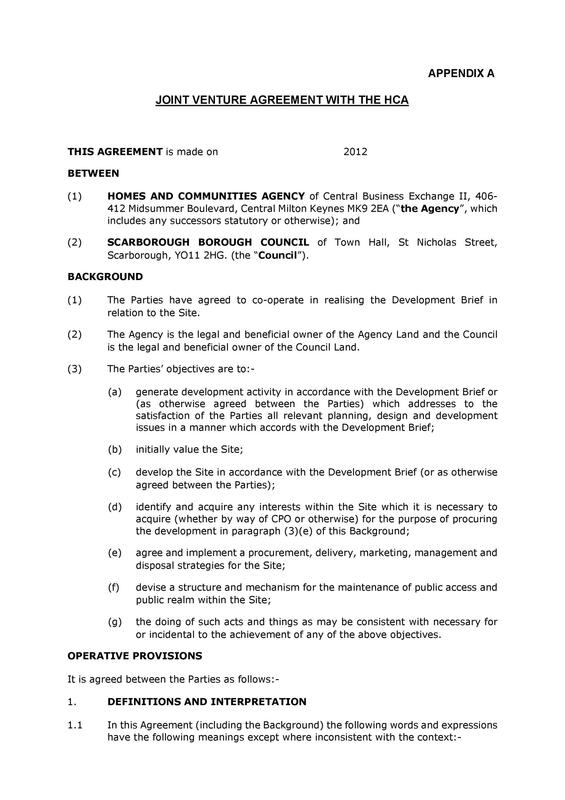 Joint ventures are flexible which means that you can set and agree upon the terms of the whole project together. This would also mean that since it won’t last for very long, you have the option to only limit your commitment as well as the exposure of your own business organization. 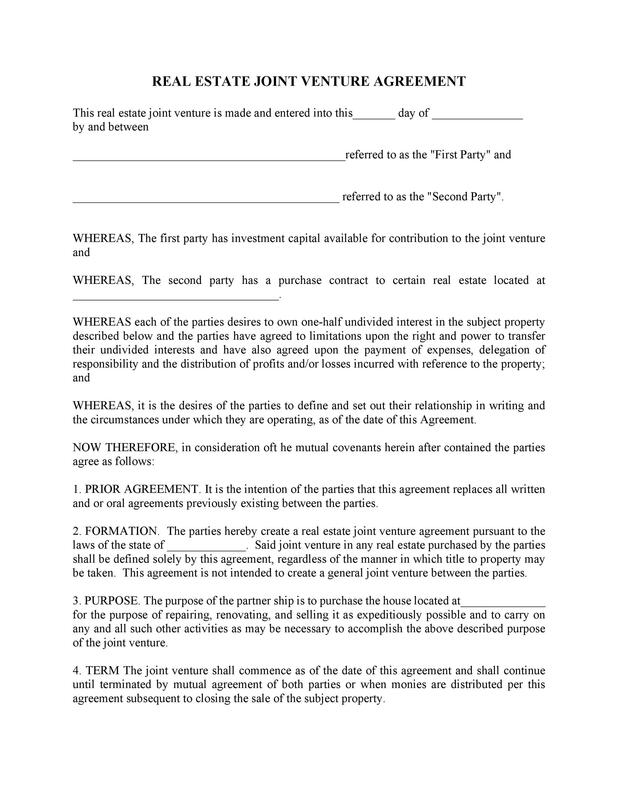 Joint ventures can end in a sale from one partner to the other. If one of the parties feels that the continuation of the project or activity they had begun together would be beneficial to their own organization, then that party can buy out the other. Smaller businesses can benefit a lot from joint ventures especially if they partner with a bigger business or brand. There would be a higher chance of project success if one of the parties involved would already have a reputable name. If the project does succeed, the credibility of the smaller business would increase vastly as well. Creating short-term partnerships with other organizations and businesses would give you a chance to build and cultivate long lasting relationships with other business owners. Having a lot of contacts and connections is always beneficial especially if you own a business and you are just starting in the market. If you are lacking in funding, you will still be able to take on new projects and make new ventures and business deals in the process. You would also save a lot of money since you will be sharing everything equally, even when it comes to marketing costs such as advertising. Starting joint ventures internationally would give your business or organization a good image as it would give the impression that you do not discriminate. This would also give you the opportunity to meet with new people with different cultures and backgrounds. 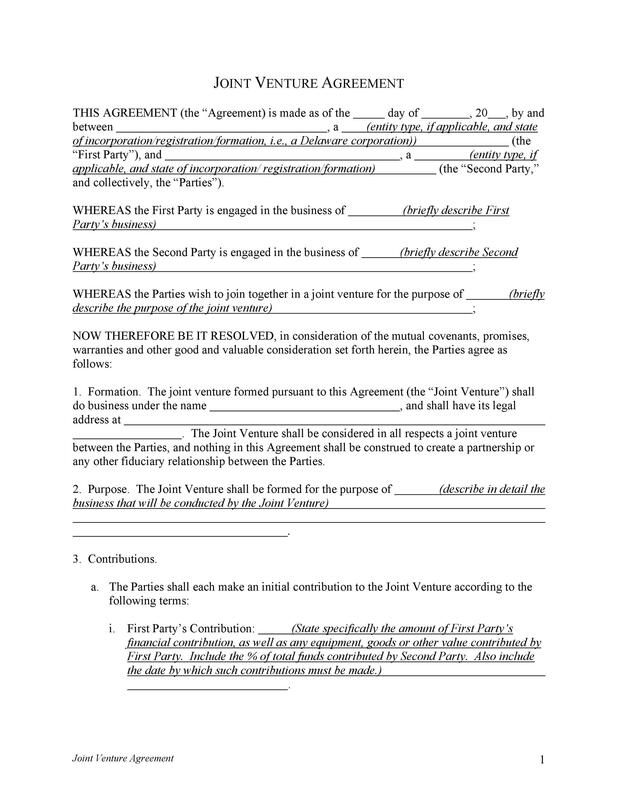 As you can see, having a joint venture agreement can be quite beneficial to your business or organization. 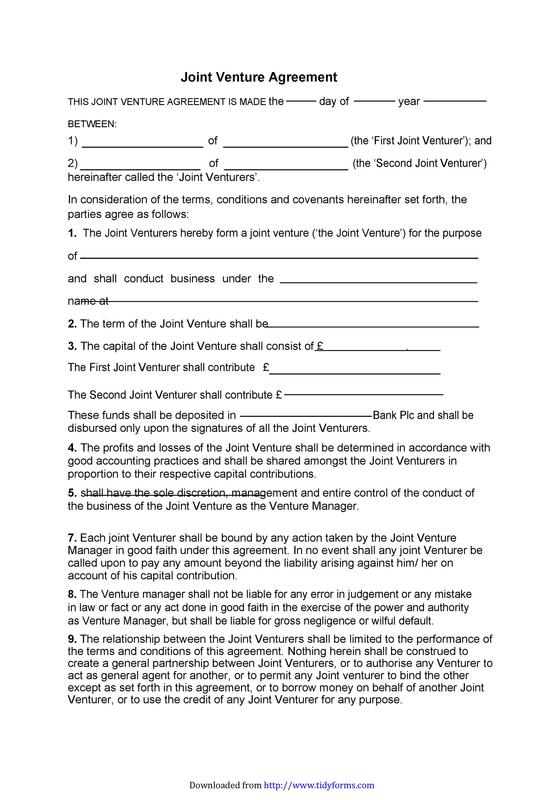 Now that you know all the benefits, let’s take a look at the different types of joint venture agreements which you can get into. Basically, this is when two separate parties agree to work on a single business project or business activity. 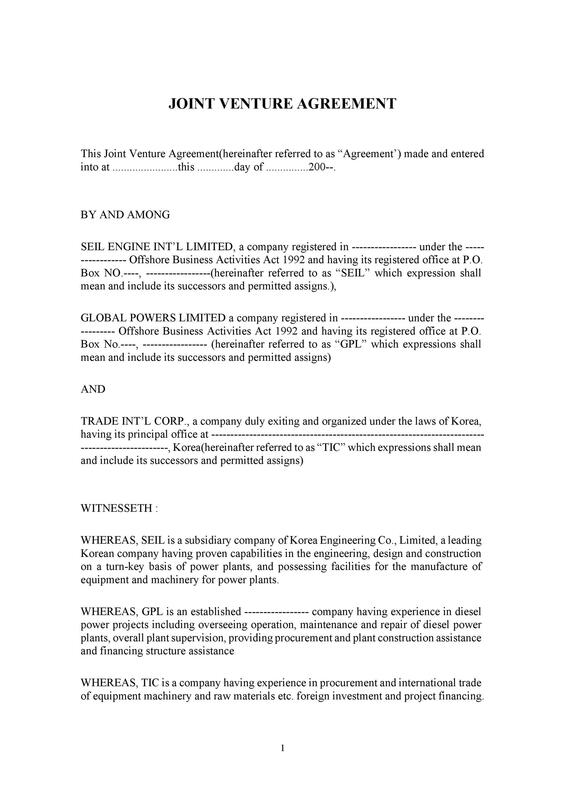 Both parties would agree on the terms and rules of the joint venture agreement and once the project or activity is done, the joint venture ends as well. In this type, a new company or corporation is created by two separate (and typically smaller) companies. 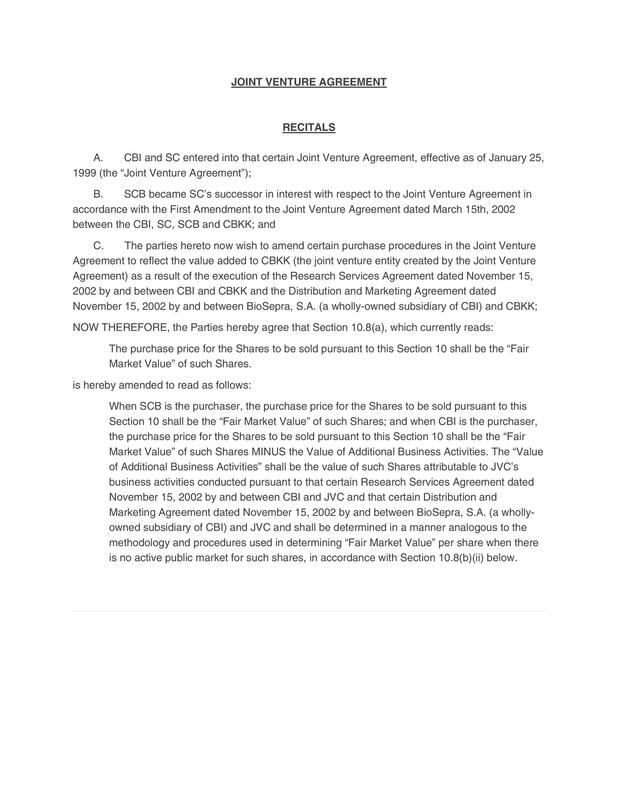 The main people involved in this type of joint venture become shareholders of the new company and it then serves to conduct the business of the joint venture. 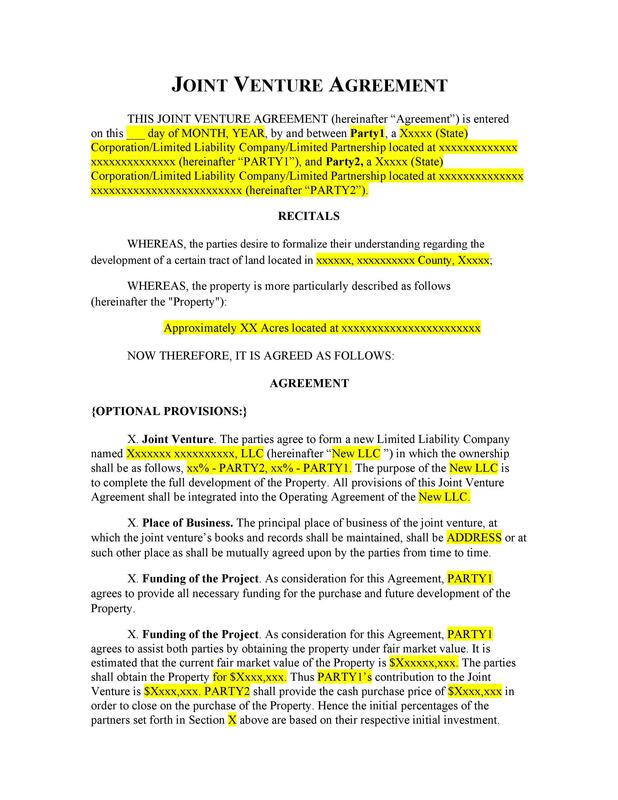 This type of joint venture is usually formed when a parent company or a main company makes an agreement with its branches or smaller companies to transfer resources (such as technology), secure their intellectual rights or market their products and services domestically. As you can see, there are different types of joint ventures which you can do and they depend on your main purpose or objective for forming one. 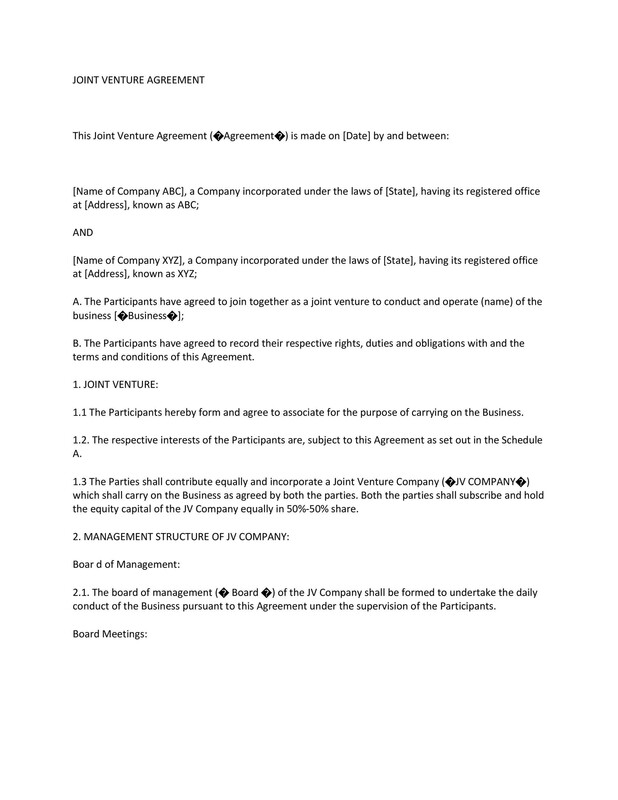 As you can see, having a joint venture can be beneficial to your company as long as you know all about it and how you would be making your own agreement and get the other party to sign. 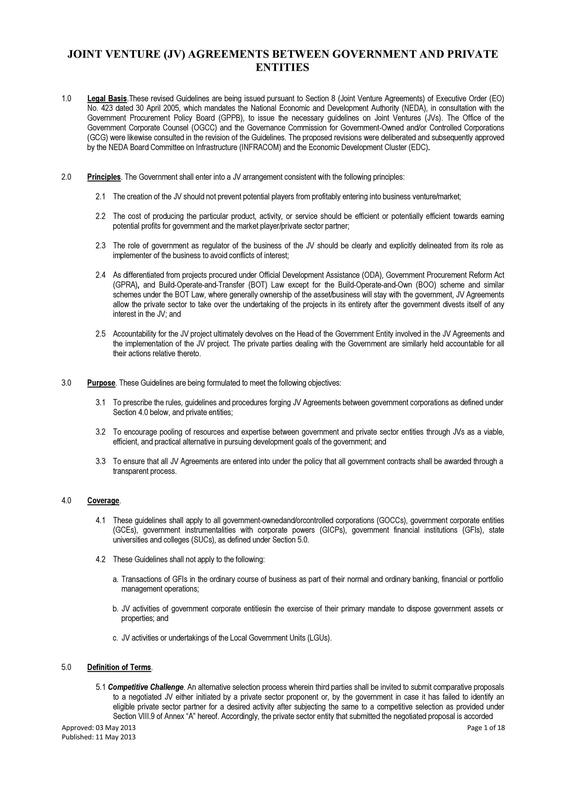 Before you start drafting a template, let’s take a look at the important elements your agreement must contain. First off, you would have to name the parties which are involved in the agreement. The names should come with a short description about what the company is about, how it operates and what it would be bringing to the table. 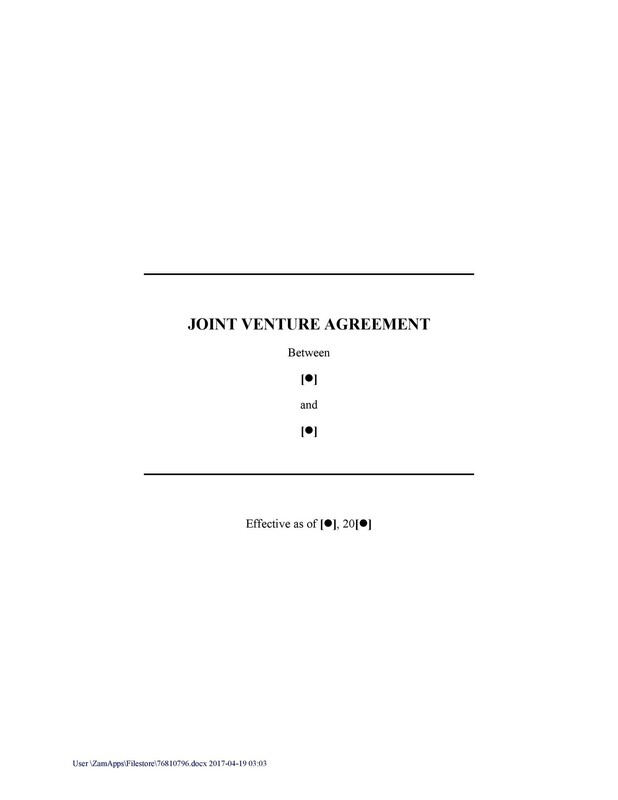 The objectives of the joint venture should also be placed in your agreement. 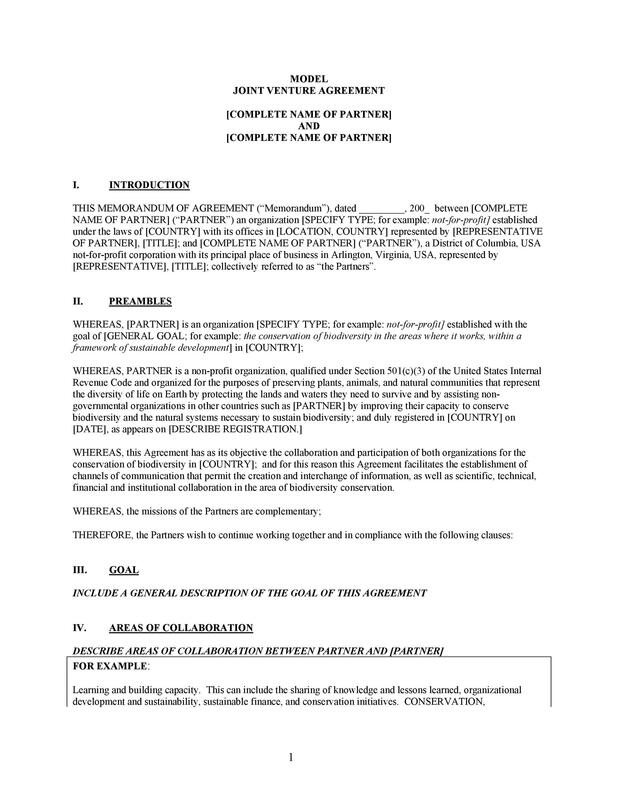 Without clear objectives or purposes, your joint agreement won’t have much bearing as this is probably the most important part of the agreement. The contributions each party will make to the joint venture. These contributions can come in the form of funding, assets, or even employees who would be working to achieve the goals of the joint venture. 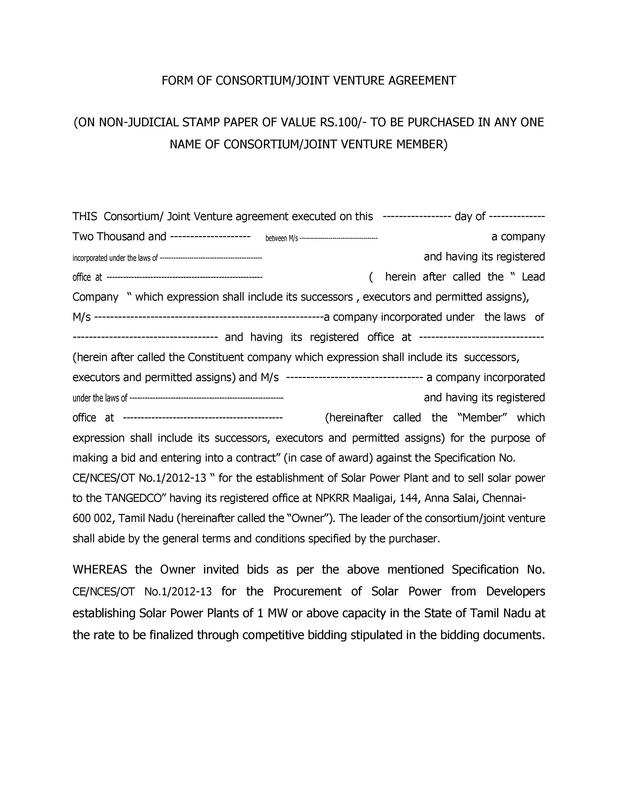 Any intellectual property which will be developed by the ones involved in the joint venture. Daily management procedures along with solutions to any issues or problems which may arise throughout the joint venture. 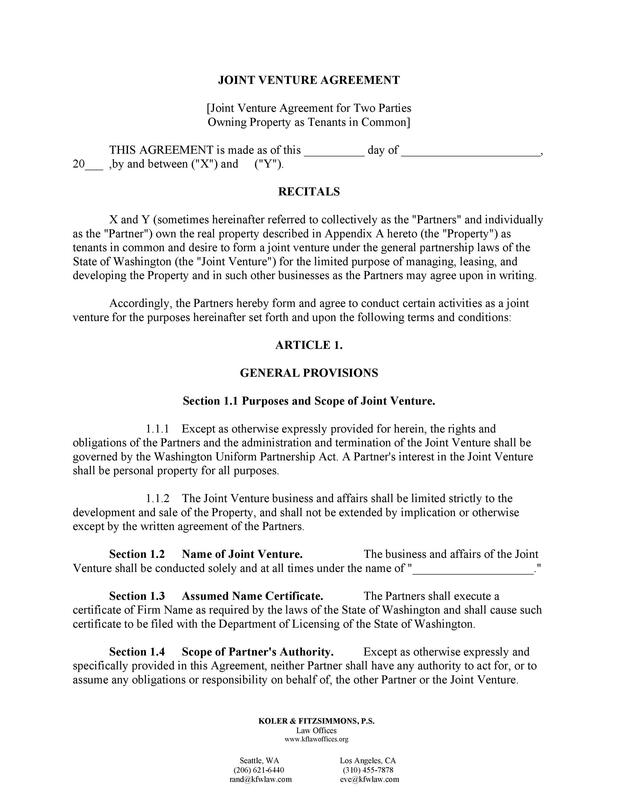 What to do if the either or both parties decide to end the joint venture. 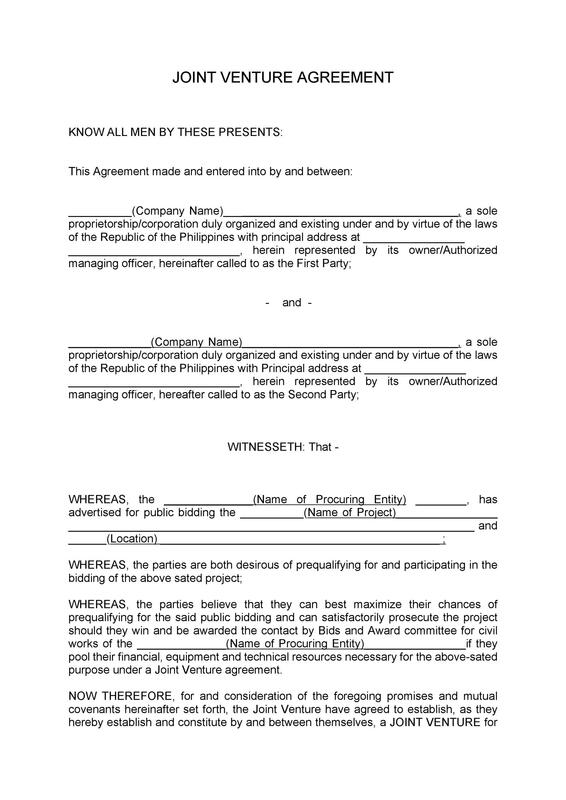 A confidentiality clause or a non-disclosure agreement which will serve to protect both parties from any legal issues. 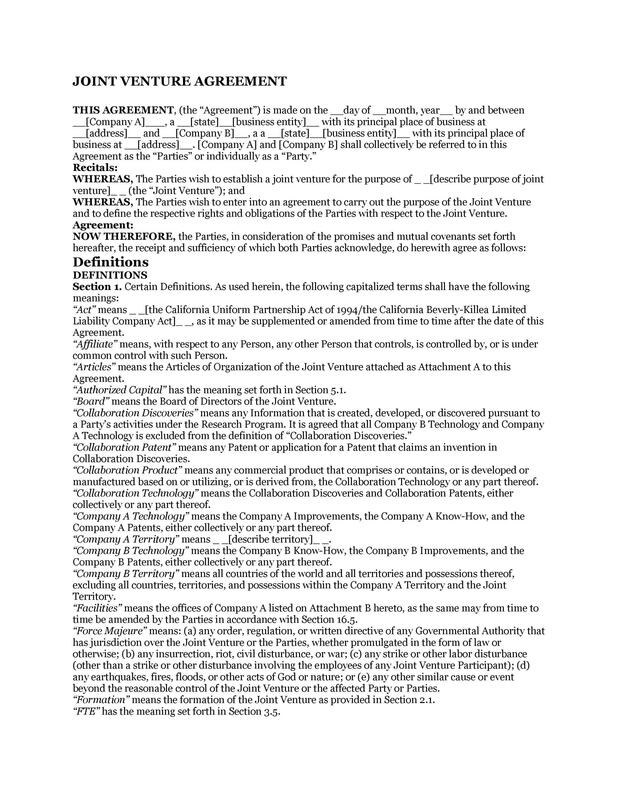 If your agreement has all these, then it would most likely be an effective one. Now let’s move on to the planning stage of your joint venture. 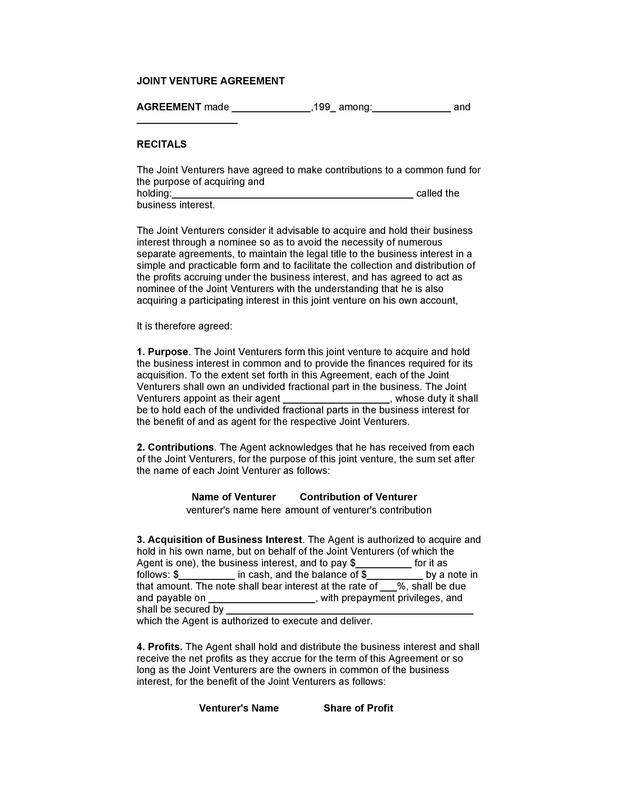 Before we get into making your own joint venture agreement template, let’s first discuss how you would plan your joint venture agreement. 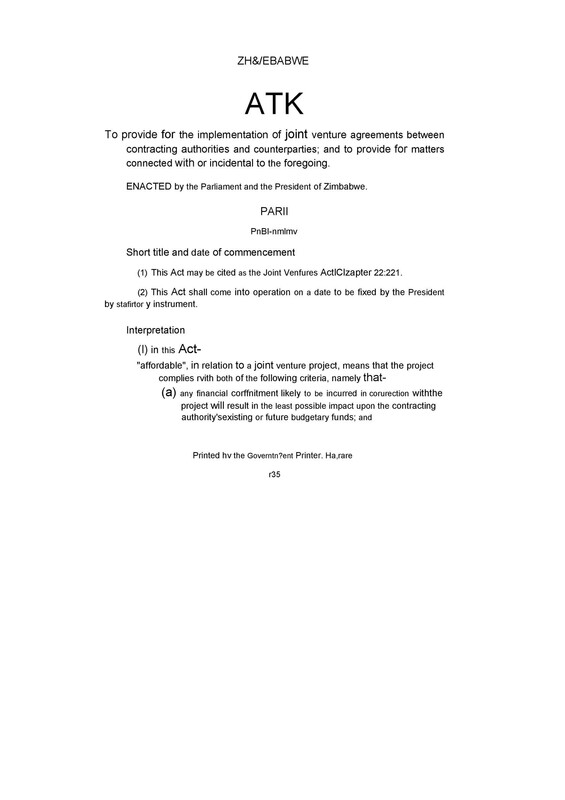 Planning would be the first step in making a joint venture agreement. You would have to take steps in order to be able to successfully plan out your joint venture. Identify why you would need a joint venture. At some point in your organization’s operation, you might come to a point where you would need reinforcements in the form or new equipment or technology you may not have or staff and employees who are experts in a given field. Establish the objectives of your joint venture, which would be beneficial to both parties. You would have to come up with a description of the main purpose or objective of the joint venture which you need to document so that you can share it with your potential partners to get them interested. Look for potential partners for your joint venture. You may have to do some research in order to find the best individuals or organizations which would be able to help you achieve the goals of the joint venture. Network and build relationships with other companies so that you can find out more about them and their businesses. This is a good strategy especially for beginning organizations as you will be learning a lot in the process and when the right time comes, you would know who to call upon to be your partner in a business venture. Once you’ve met with some great people and business owners, take time to schedule informal meetings with them so that they also get to learn about you and your company. Once you’ve picked a good company, try to determine if it would be a good fit with your own company and the purpose of the joint venture. You would have to agree upon the objectives and what you will be willing to contribute to the joint venture to see it succeed. Both companies have to be equally supportive and knowledgeable on how joint ventures work. Come up with a nondisclosure agreement for both parties to sign. This should state that both companies would work openly with each other and communicate about anything and everything regarding the joint venture. This would ensure that neither parties would have the opportunity to take advantage of the other the whole time. 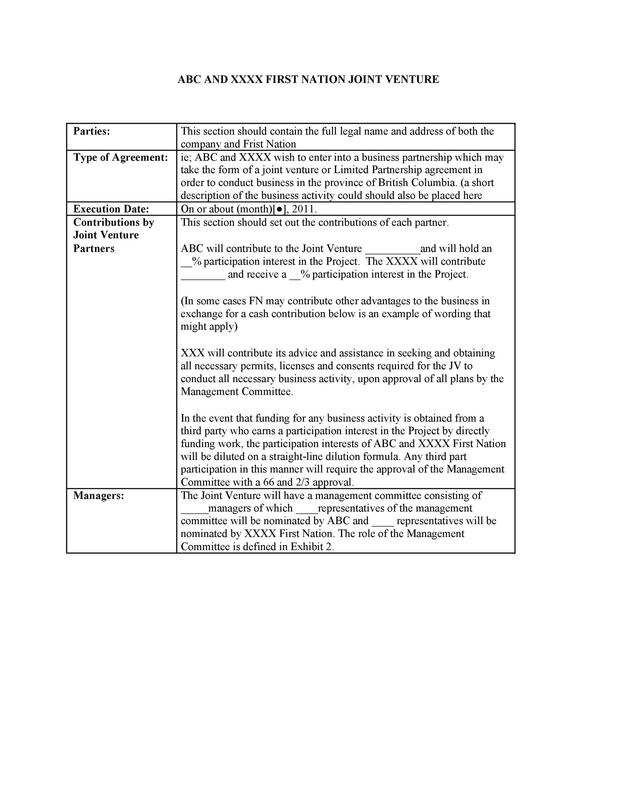 Make your letter of intent as this would be the first step in forming an official joint venture agreement. 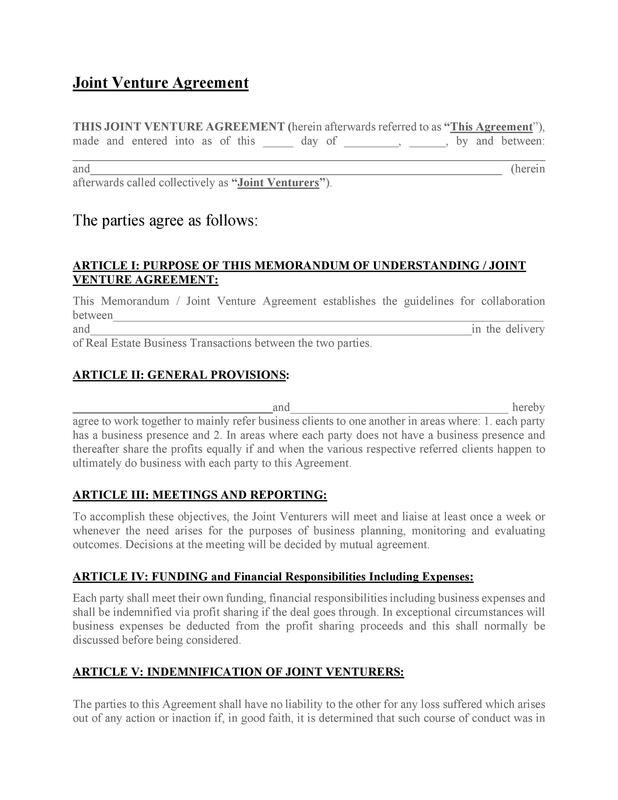 It should contain the purpose of your planned joint venture as well as the intent to negotiate terms of the agreement. 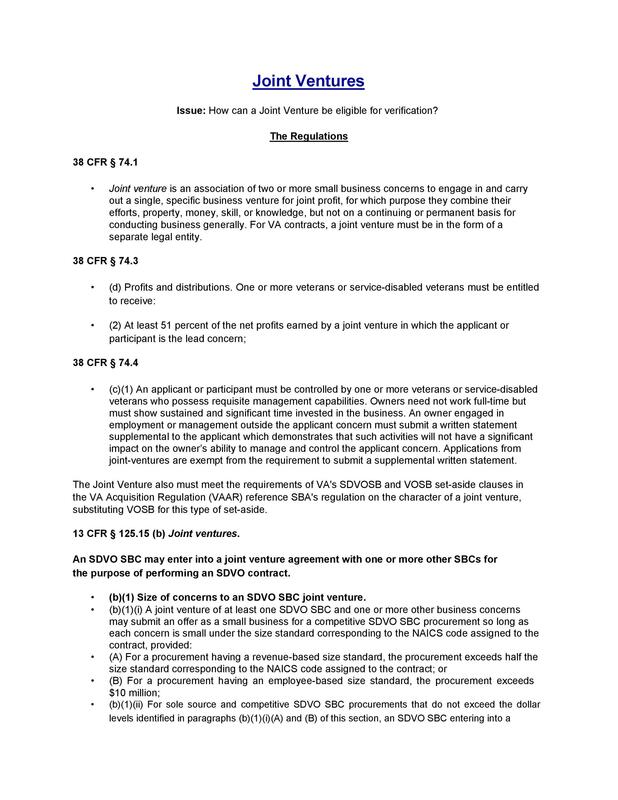 Follow these guides to be able to start your joint venture. 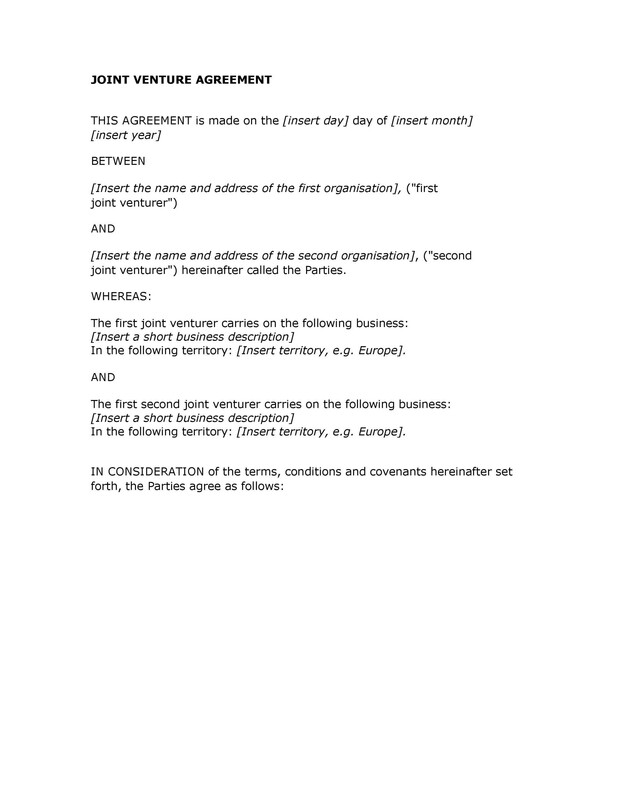 Once you have a good partner in mind and you’ve sent your letter of intent, you can start thinking about making your template for the agreement. 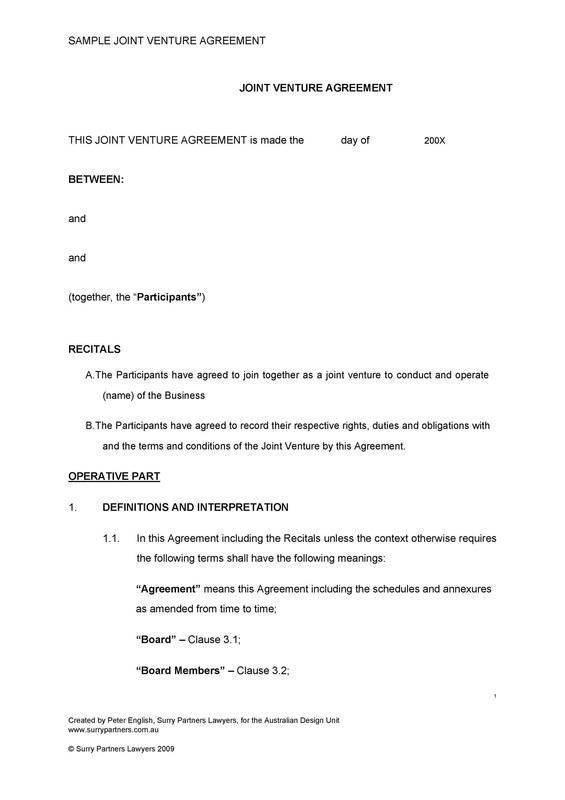 So now you’ve planned your joint venture and you’re ready to make an agreement with a second party. 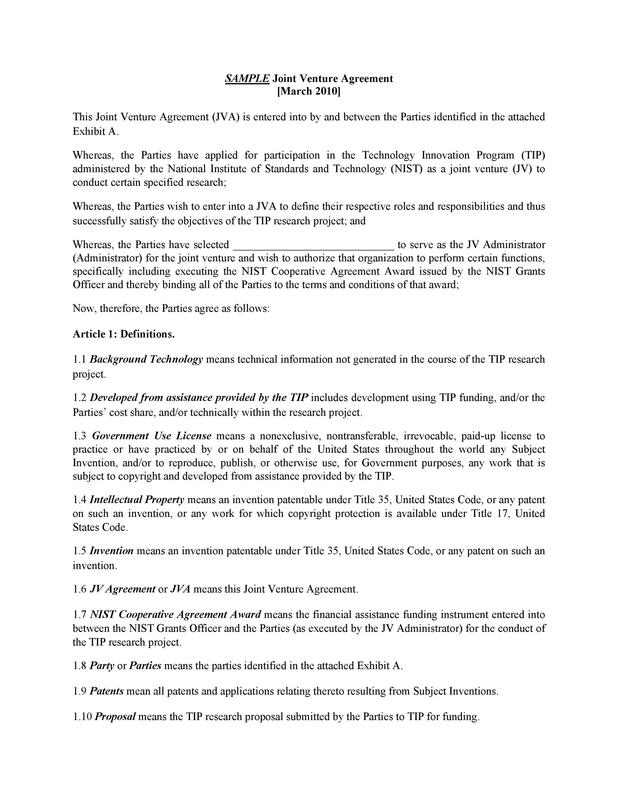 For you to make a good joint venture agreement sample you may need some helpful steps and tips to guide you. 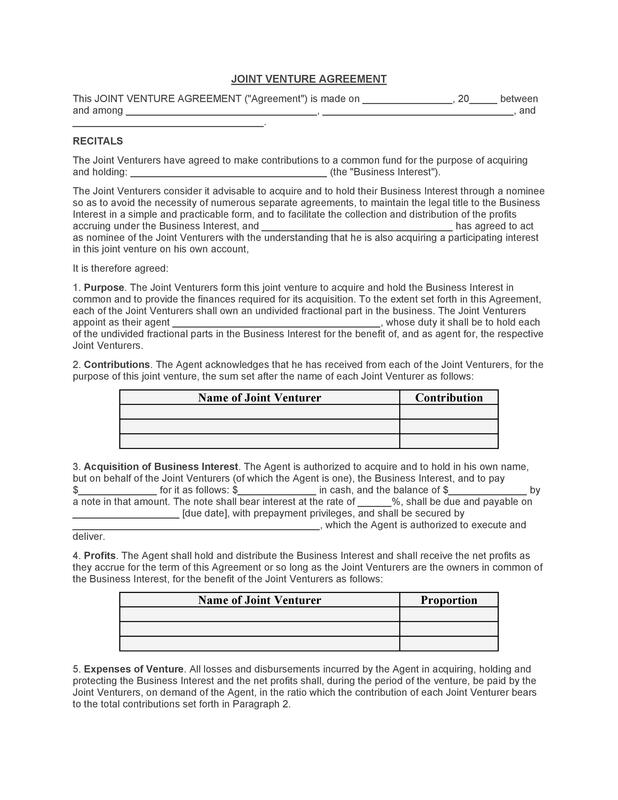 Make a decision on what kind of format you’d like to use for your joint venture agreement template. Examine the scope and purpose of your joint venture along with your partner along with the expected time frame. 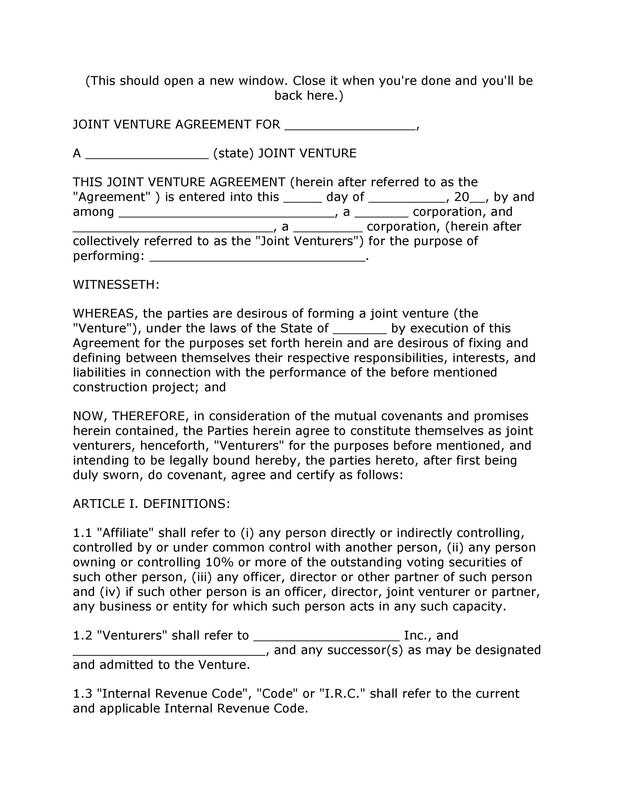 A joint venture can take on any forms such as a partnership, a brand new organization or even a contractual agreement. For larger projects, you may have to create a new organization or a new corporation. This new entity should come with a new identity and a set of staff members and superiors, though there may be an overlap of the employees with the two partner companies. 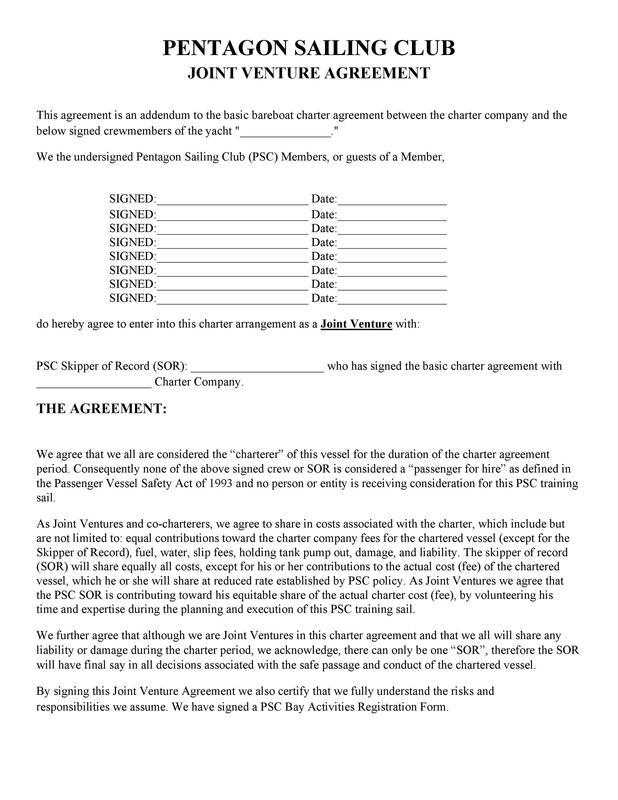 If you’d like to remain in your separate companies, then you can form a joint venture partnership wherein you won’t have to merge with another party. 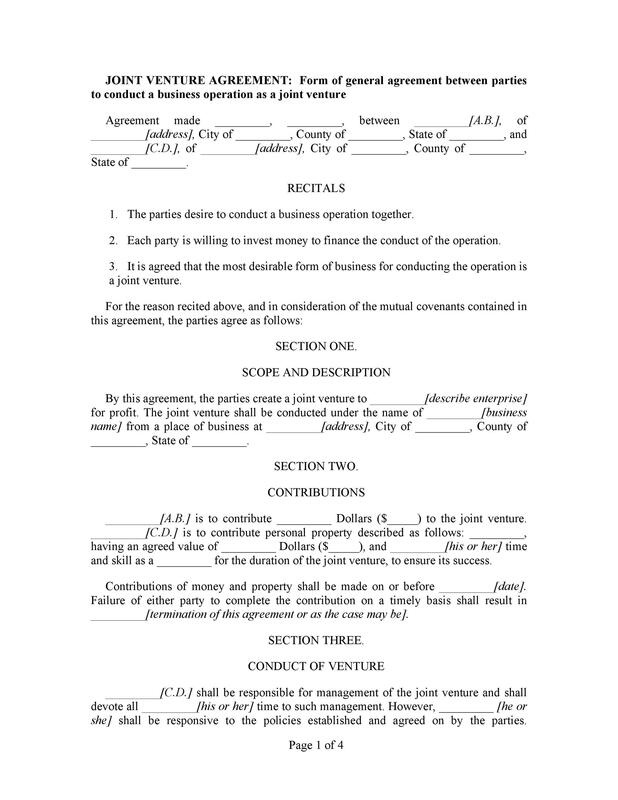 The agreement then would establish how you would be sharing responsibilities as well as liabilities. You can draft a contract or a joint venture agreement sample for smaller or more temporary projects which you see as just a one-time deal. In doing this, both parties keep their identities and merely join resources to complete a specific project. 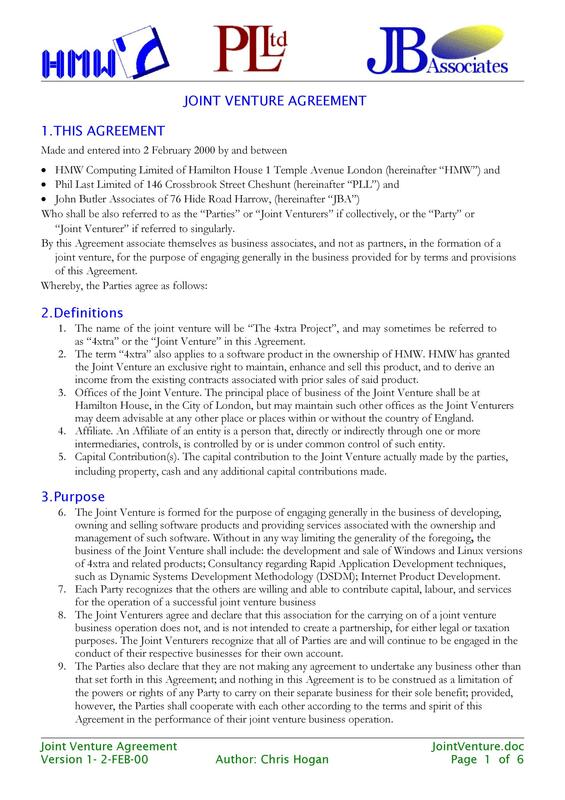 When making your agreement, you should first introduce the main purpose of the joint venture and the parties which are involved. Name the parties and give a short narrative describing their operations. 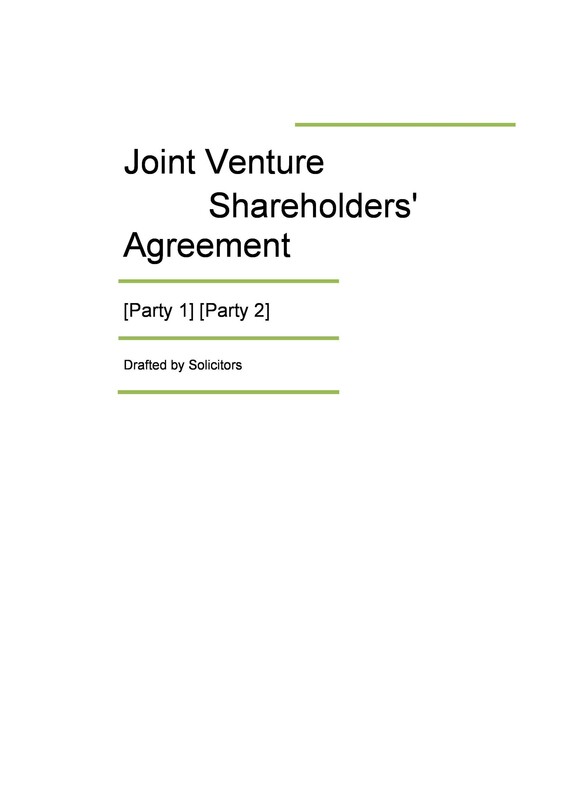 Also introduce the title of the joint venture with a short narrative describing its purpose. Establish all the important and specific terms and/or issues and define them clearly. You can create a heading for this portion to emphasize it. Lay out the goals and objectives of the joint venture. Having this would allow both parties to focus on what needs to be accomplished as the project is being carried out. 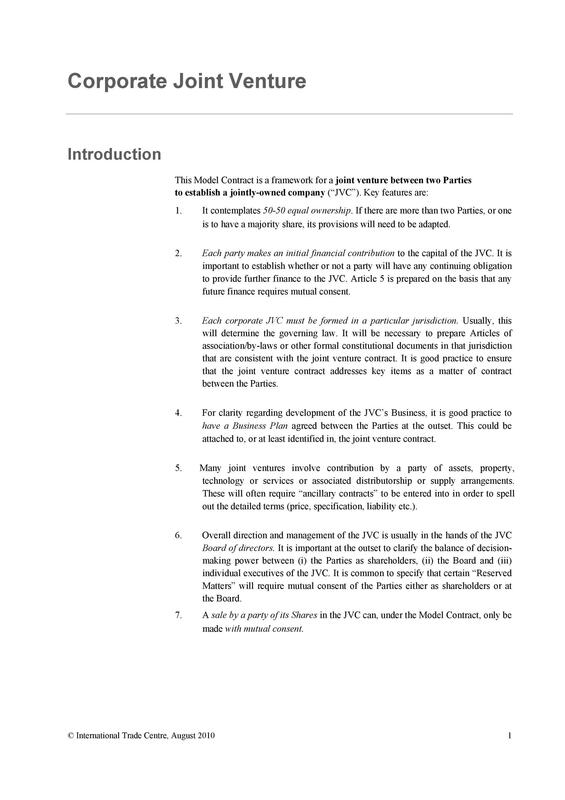 Lay out the formation of the joint venture. To do this, both parties would have to agree on whether they would be creating a new corporation with a new identity or retain their own companies and identities. 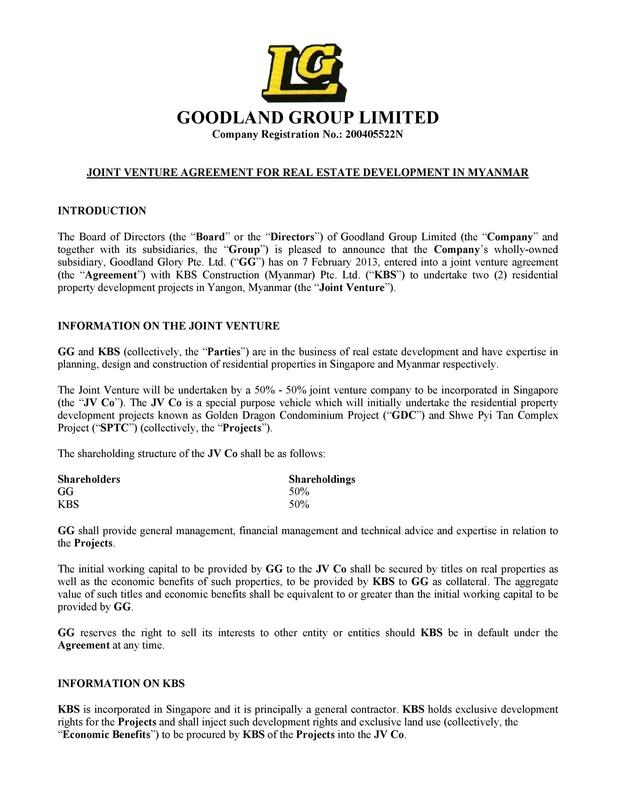 Establish how the joint venture will be managed. 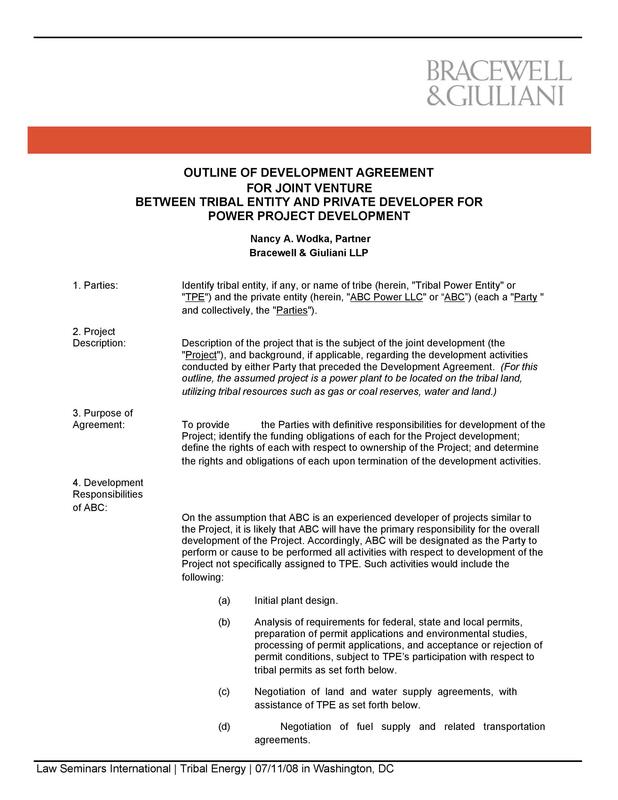 To ensure the success of your joint venture, both parties would have to agree on how the project will be run. You would need to define the management structure, the whole process of selecting the people who will be in charge, any compensation to be given to the people involved in the project, the responsibilities and limitations of the selected management as well as how often you will be meeting your people. 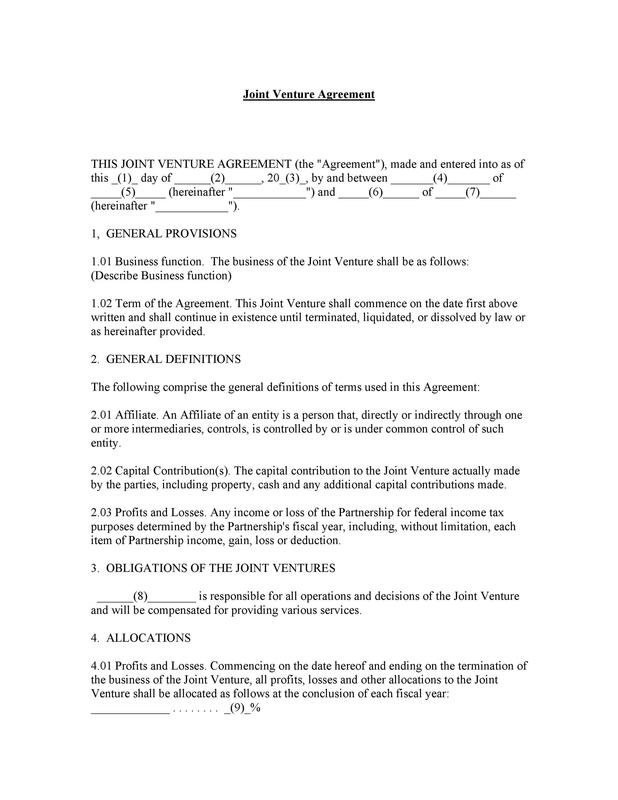 Discuss any issues or concerns regarding finances related to the joint venture. Establish how profits, assets and costs will be shared and talk about what each party would have to give to the joint venture in terms of funding or other resources. 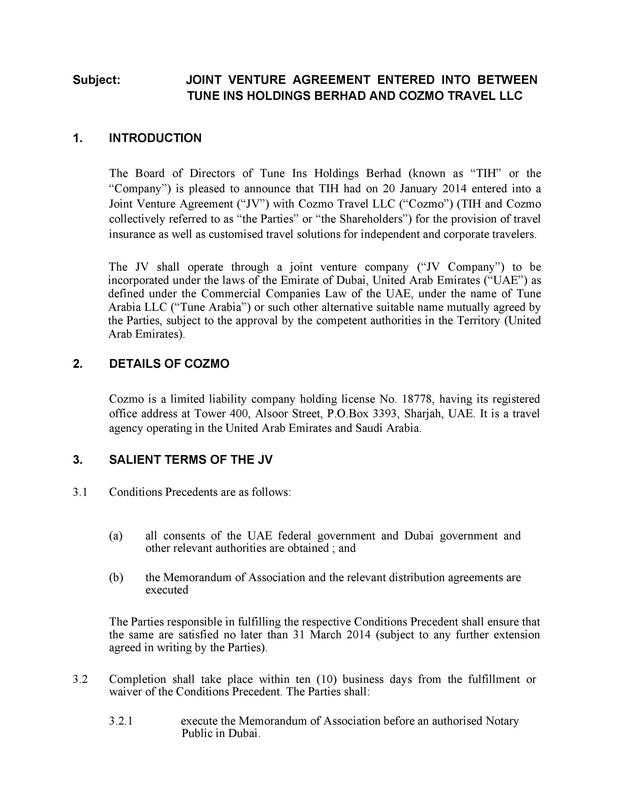 Define the roles and responsibilities of all the people involved in the joint venture. 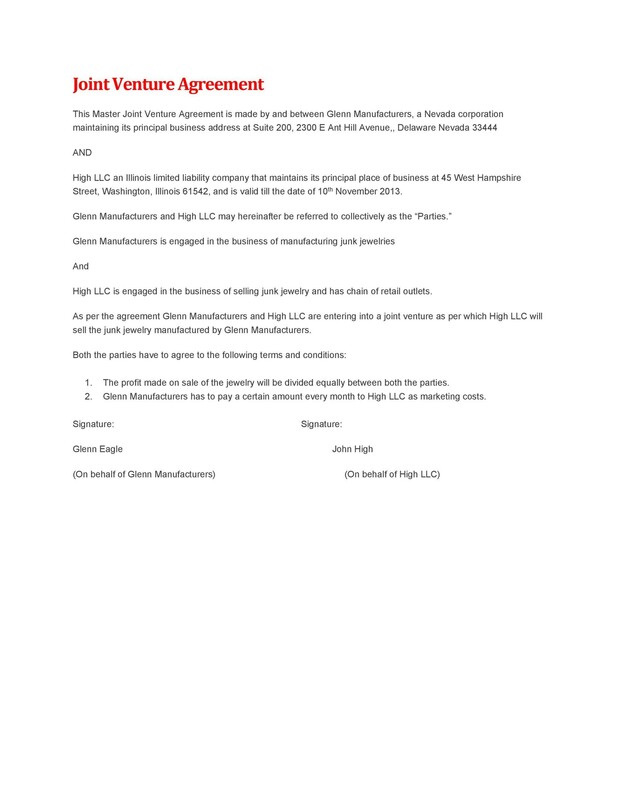 Talk about from which party the employees will come from and what they will be doing to be able to carry out the purpose of the joint venture. Think about any disagreements or issues and agree on what is to be done when these issues arise. You would have to give clear procedures on how to solve problems. Make a clear timeline wherein the objectives of your joint venture should have already been met. 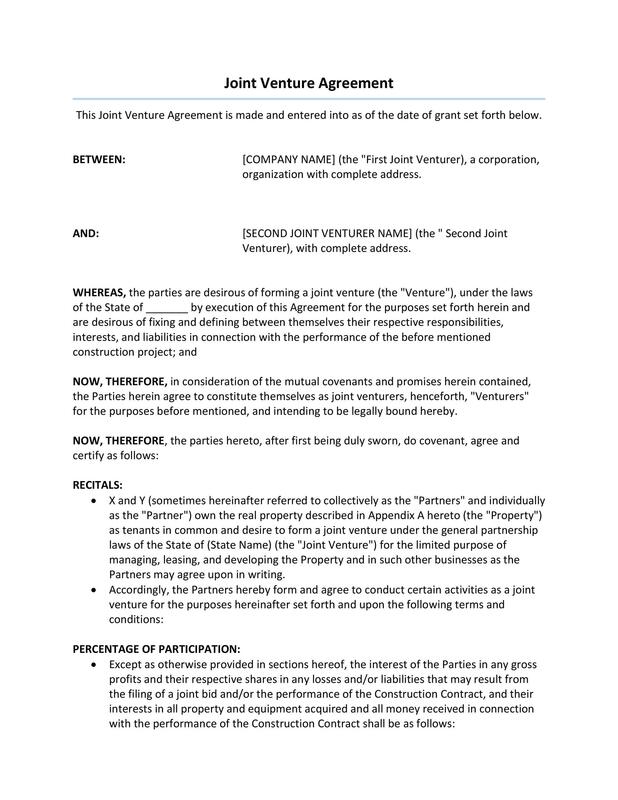 State the exact date when the joint venture is to end as well as what is to be done when you decide to end the joint venture before the end date. This could be because the project is already failing or the continuation of the project doesn’t make sense, financially, anymore. 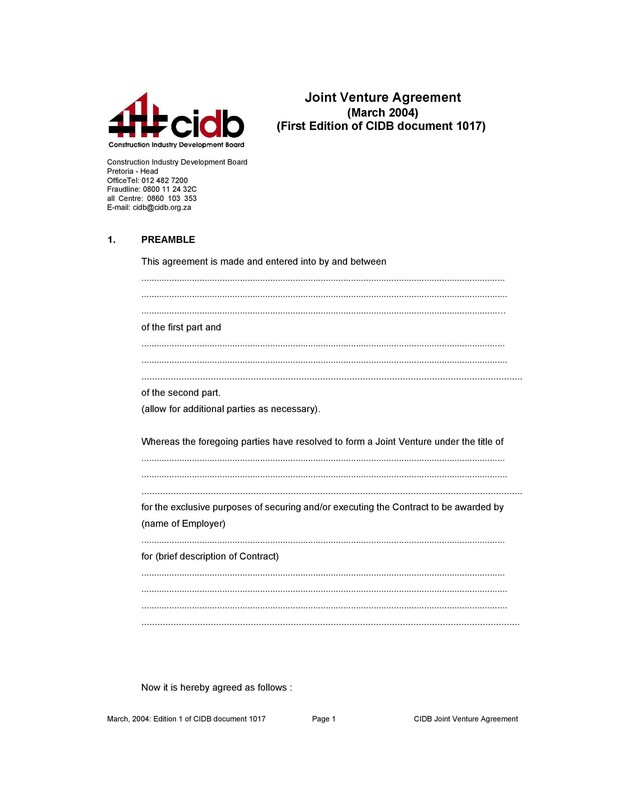 Add a clause for confidentiality, especially if either party or both parties require it. Finally, you should add in a part where the authorized people would affix their signatures. The agreement should be signed by both participating parties for it to be official. Both parties should also have a copy of the final, signed agreement.